Central American migrants traveling in the caravan of migrant Via-Crucis attend their legal briefing in Tijuana, Baja California, Mexico in April. 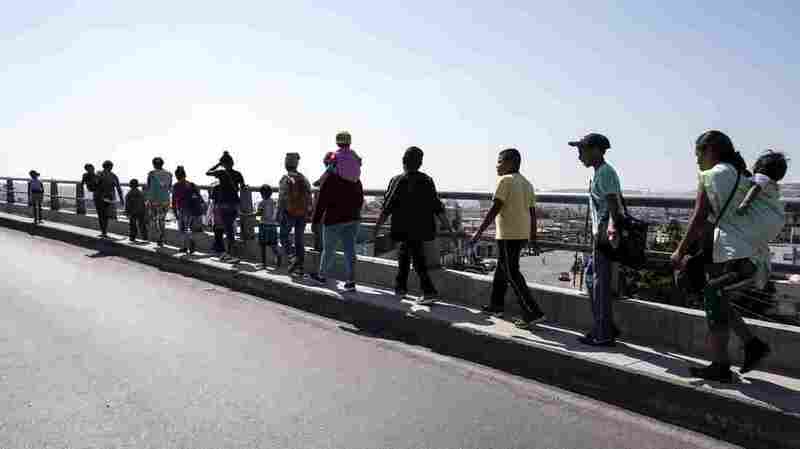 Central American migrants traveling in the caravan of migrant Via Crucis go to their legal counseling in Tijuana, Baja California, Mexico, in April. On Memorial Day weekend, President Trump tweeted that people "should put pressure on the Democrats to end the terrible law that separates children from their parents as soon as they cross the border into the United States "
In fact, the policy in question was enacted by its own government. On May 7, Attorney General Jeff Sessions said in a speech, "If you smuggle a child, then we will prosecute you, and that child will probably be separated from you, as the law requires." "If you did not separate your child do not take it illegally across the border, it's not our fault anyone does. " Meetings announced the policy in Scottsdale, Arizona. Under US law, illegal entry is a crime. The Trump administration has ordered that such attempts be prosecuted, meaning that the adults are detained and all the children accompanying them are separated. John Kelly, White House Chief of Staff, told John Burnett of NPR earlier this month that "the children should be cared for" – in foster care or whatever. But the big point is that they are illegally coming to the United States and this is a technique that nobody hopes will be used extensively or for a very long time. In an interview with NPR's Morning Edition host Steve Inskeep, Cecilia Muñoz, the former interior minister of the United States, unequivocally said that this was not a policy that was followed by the Obama administration. The Obama administration did not do that, no, we did not separate the children from their parents, "Muñoz said. "This is a new decision, a political decision by the Attorney General," said Muñoz, "bringing us in line with the most brutal regimes in world history." Nevertheless, the White House continues to blame the Democrats for violating immigration laws. In a White House briefing, senior policy adviser Stephen Miller said what he called "the current immigration and frontier crisis and all the associated concerns, the 'exclusive product of loopholes in federal immigration laws that the Democrats do not want to shut down." Democrats, however, are the minority party in both chambers of Congress. The republican-led majority still needs to address important immigration laws at this meeting, although spokesman Paul Ryan, R-WI, has voted to hold polls this summer. The Senate held a weeklong debate on numerous immigration-related bills in February, but none received the 60 votes necessary for the passage.